Toxic wastewater that surged through a dry riverbed in southern Israel at the weekend left a wake of ecological destruction more than 20 km (12 miles) long. 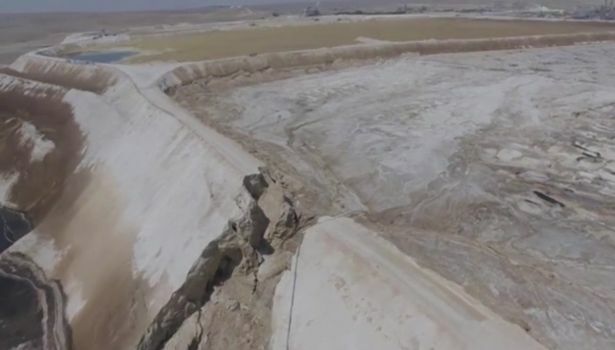 The flood began last Friday when the 60 meter (yard) high wall of a reservoir at a phosphate factory partially collapsed, letting loose 100,000 cubic meters (26.4 million gallons) of highly acidic wastewater in the Ashalim riverbed. That was enough fluid to fill 40 Olympic-sized pools. The toxic torrent snaked through the desert, singeing anything in its path, before collecting again hours later in a pool several kilometers from the Dead Sea, the lowest point on earth. Haaretz has a decent article on the implications of the failure, noting that the spill has damaged an area of important ecology. The tailings pond contains the waste from a fertiliser plant, owned by Rotem Amfert. One can only speculate about the cause of the failure, although a slip in the embankment does not seem to have occurred. Overtopping or( perhaps more probably) a piping failure seem to be the prime candidates. I have noted previously that the failure rate in tailings facilities is unacceptably high. There would be no tolerance of this rate of failure in any other of geotechnical work, especially given the consequences of these major leaks downstream. I remain deeply frustrated that this problem is allowed to persist. I’m curious about the apparent erosion all along the sides of the now absent pond. Is that a result of the rapid draining, or did the erosion cause the breach? Was there enough fetch in the pond to have produced waves that ate away at the dam?